New Author 14th January 2018 ArsenalTagged captain, fans, football, footballers, groves1 Comment on Vic Groves – A Tribute. Originally posted on the Online Gooner Fanzine. First of all, this isn’t meant to be an in depth look at Vic Groves’s career at Arsenal. No, I’ll leave that to people much better than me to do that and do the great man justice. This is a tribute to the values he upheld and the love he had for our club. Unfortunately, it is an unwelcome result of a dearth of silverware that Vic Groves doesn’t adorn the exterior of The Emirates. Silverware normally cements player names firmly into the annals of ‘Club Greats’. The ’32 Greats” that stand on the outside walls of our modern stadium doesn’t have a rigid criteria, but if there were certain requirements – then Vic would meet them. I confess to ignorance regarding the current hero of this piece. It wasn’t until I read two books that I became aware of his exploits. I heartily recommend Geordie on the Wing by Dave Seager and Red Letter Days by Jon Spurling which expertly highlight the era which Groves performed so admirably. As a Gooner, I think it is important to learn as much of our vibrant and extensive history as we can. Not many clubs in our country can boast of such a gleaming back story so we shouldn’t take it for granted. Just check out The Arsenal History to get a taste of what our club has to offer. Such fascinating tales and gallant heroes. Vic Groves was one of them. Vic sadly passed away in January. A gentleman and a brilliant servant to our club, he will be sadly missed by all who came into contact with him. This list will be rather long however, as he was always one of the first to help newcomers at Arsenal during his playing days on the pitch and whilst he worked in his car garage near Highbury – as was his way. Injuries were to blight the first few seasons of Vics promising fledgling career though. A persistent knee injury followed by a niggling back complaint hampered his progress. It wasn’t until 1958 that he finally started to string some appearances together and show the Gooner faithful why he was signed. In 1959, he changed his position to Wing-Half, which in my limited understanding I would describe as a wide-forward. Everything was set for Vic to establish himself and push on and he duly delivered. 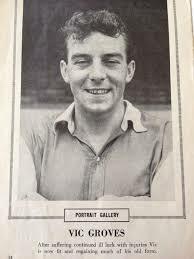 1959 was also the year that Groves became Arsenal Captain, a distinction he carried until 1962. 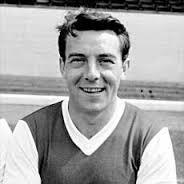 Vic left our club in the 1964/65 season, after 9 years. No glittering accolades were lifted during his time, but plaudits and the glowing respect of his peers had been earned and stockpiled. Even during his injury-peppered seasons – he carried himself as he always did – like a true Arsenal player. The man oozed class and cared deeply for the club he played for. Perry Groves, his second cousin, carried on that tradition throughout his own playing career. A lot is made of the phrase ‘ The Arsenal Way’. Many paraphrase it, a lot use it but take no heed of its meaning. It is the way you carry yourself as an Arsenal player. The very manner that you are perceived. Arsenal players now wear matchday suits before a game. That is an embodiment of the ‘Arsenal Way’. Youth Trainers at Arsenal endeavoured to school their young charges of what was expected of them as representatives of Arsenal Football Club. Geordie Armstrong – former teammate of Vic Groves – was one of these trainers. He went to great lengths to extol the virtues of this way of life. Well, Vic Groves was a perfect example. Hopefully the Club will commemorate a true professional who squeezed every last drop of effort into every one of his 203 appearances for them. I have no doubt that if a minutes silence is held, then in true Vic Groves fashion, it will be impeccably observed. Consider this a salute to a true Arsenal Hero. R.I.P Vic Groves.